When you stay at Oceana on Broadbeach in Broadbeach, you'll be on the beach, just steps from Kurrawa Beach and 3 minutes by foot from Surfers Paradise Beach. This 4-star apartment is 0.8 mi (1.2 km) from The Oasis and 0.8 mi (1.4 km) from Gold Coast Convention and Exhibition Centre. Make yourself at home in one of the 45 air-conditioned rooms featuring kitchens with full-sized refrigerators/freezers and stovetops. Rooms have private balconies. 55-inch flat-screen televisions with cable programming provide entertainment, while complimentary wireless Internet access keeps you connected. Conveniences include microwaves and coffee/tea makers, and housekeeping is provided weekly. Dip into one of the 2 outdoor swimming pools or enjoy other recreational amenities including a sauna and a fitness center. Additional features at this apartment include wireless Internet access (surcharge), tour/ticket assistance, and barbecue grills. Featured amenities include a business center, limo/town car service, and dry cleaning/laundry services. Free self parking is available onsite. 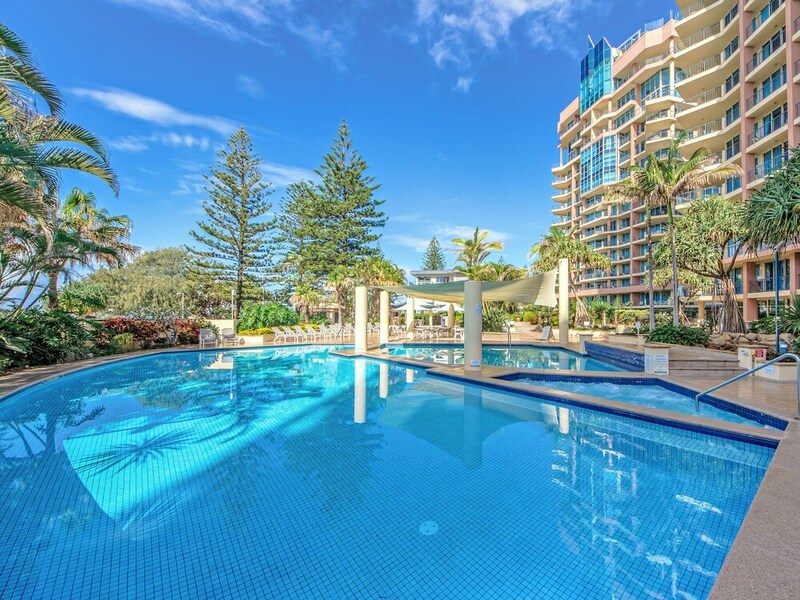 Oceana on Broadbeach features 2 outdoor swimming pools, a spa tub, a sauna, and a fitness center. Wireless Internet access is available for a surcharge. Business-related amenities at this 4-star property consist of a business center and limo/town car service. This beach apartment also offers tour/ticket assistance, barbecue grills, and a garden. Complimentary self parking is available on site. Oceana on Broadbeach is a smoke-free property. 2 outdoor swimming pools are on site along with a spa tub. Other recreational amenities include a sauna and a fitness center. The front desk is open daily from 8 AM - 5:30 PM. Guests planning to arrive after 5:30 PM Monday-Friday, 4 PM Saturday, or 1 PM Sunday and public holidays must contact this property in advance to arrange check-in. Please contact the property using the information on the reservation confirmation received after booking. Cribs (infant beds) are available for AUD 40.0 per night. A resort fee is included in the total price displayed. Only registered guests are allowed in the guestrooms. Parking height restrictions apply.